Got a sore, scratchy throat or a tickle that just won't quit? Stop those irritating sensations with a simple spritz of Echinamide Throat Spray Formula with Propolis from Natural Factors. Echinamide Throat Spray Formula with Propolis is an oral spray with immune-boosting Echinamide, antibacterial propolis and other natural herbs designed to soothe an irritated throat while also freshening breath. Echinamide is a patented, super-extracted Echinacea compound produced from the roots and flowers of organically grown, immune-boosting Echinacea. Picked at their peak and on-site, lab-certified to be a the highest potency, these plants provide you with the most powerful immune support possible. 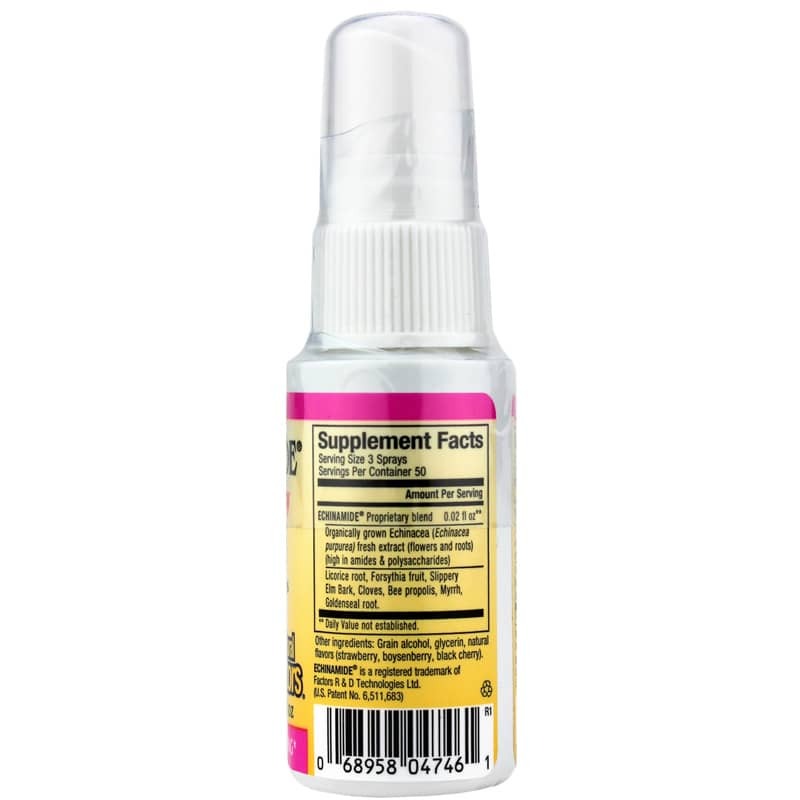 This throat spray also contains antibacterial propolis as well as herbs like goldenseal, forsythia, slippery elm and licorice to naturally fight infection and soothe and lubricate a dry throat, making it particularly beneficial for teachers, lecturers, singers or anyone who uses their voice a lot throughout the day. And with cloves, myrrh and black cherry, it also makes a great breath freshener! In a small, convenient spray bottle, Echinamide Throat Spray Formula with Propolis is easy to pack and carry, fitting perfectly into a small pocket in a purse or backpack for on-the-go access. For optimal quality, Natural Factors products are manufactured in accordance with Good Manufacturing Practices of the FDA and Health Canada. Tackle the tickle naturally for optimal health. 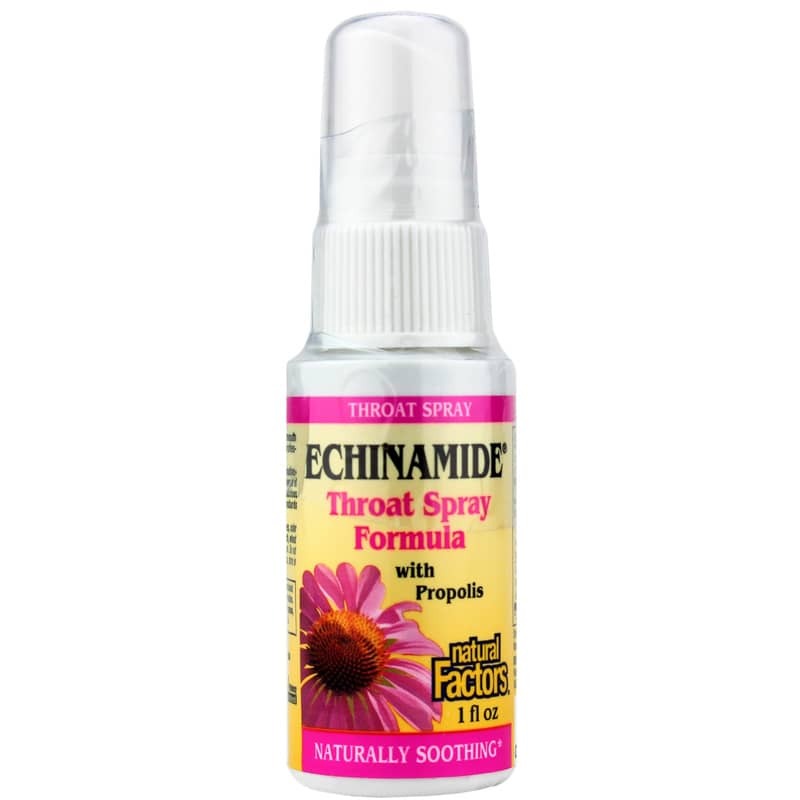 Order Echinamide Throat Spray Formula with Propolis. ECHINAMIDE Proprietary Blend 0.02 fl. oz. Other Ingredients: grain alcohol, glycerin, natural flavor (strawberry, boysenberry, black cherry). Contains NO: dairy, soy, starch, wheat, yeast, artificial preservatives, color or sweeteners. Adults: Spray 2 to 3 times in mouth as needed or as directed by a health professional. Not recommended for children under 2 years. If you are pregnant or nursing, please consult your healthcare professional before using this product. Keep out of the reach of children.